Help for families of wrongful death victims in Chicago. The websites creator or author is Chicago Wrongful Death Lawyer. Copyright 2013 Chicago Wrongful Death Lawyer is the owner of the copyright for this website. The web server used by Chicagowrongfuldeathlawyers.net is located in Lansing, USA and is run by High Rank Websites. On this web server 30 other websites are hosted. The language of those websites is mostly english. 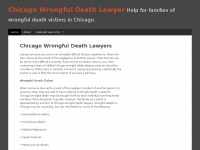 The Chicagowrongfuldeathlawyers.net websites were developed using the programming language PHP and served by a Microsoft-IIS server. For managing the data of the webpages the CMS WordPress is used. XHTML 1.0 Strict is used as markup language on the webpages. Indexing the data of the website and following hyperlinks on it is explicitly allowed by robot information.